Yesterday was a beautiful spring day and my last chance to see King Tut. The exhibit sponsored by National Geographic in part, runs through April 15 at the Museum of Fine Arts in Houston. It was a nicely arranged exhibit and designed with managing large crowds. Verbiage regarding display items was on several sides, low and high—plus the audio tours. I was fortunate to make the 11:30 timed entry as it seemed half of Houston’s school children were there at 1 PM. While I cannot do justice to the exhibit in a few words, I can make a few observations. The pieces ranged in size from quite large—the larger the figure the more important he or she was—to quite small. 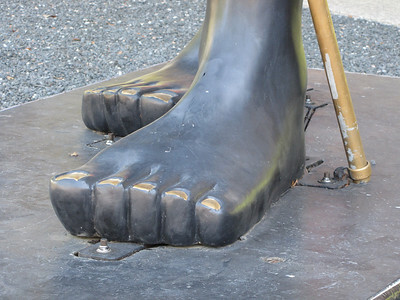 Gold was considered to be the skin of gods, King Tut had gold toes and fingers—like gloves with just the fingers and I don’t think we have a similar word for socks with toes. The jewelry was gorgeous and very intricate—and looked heavy. Counterweights were used on many of the necklaces. Also of interest was the idea of a written description of what the image was and what it was doing and so forth on the image itself. Pictograms are always fascinating and provide an additional textural interest. I ate my lunch in the Cullen Sculpture garden, something I always want to do but the weather seems to rarely cooperate. It was perfect and many people bought a lunch from a bus in the parking lot. Next on my agenda was a lecture on the origins of crowns, scepters, and thrones. This was fascinating illustrating the influence of Roman, Persian, Chinese, and Turkish artwork upon each other. Dragons and lions and pearls and halos and kerchiefs and sun-rays were borrowed, reworked, and transported. As always on my museum forays I discover an exhibit or two. This time I noticed a display of photographs mailed to the museum in form of postcards or Polaroids or prints. A beautiful print by Keith Carter, my photography instructor, was prominently displayed. The silver gelatin print features two boys, one holding a photographic flash. And then there was Olitski. I was not particularly fond of Color Field or Abstract expressionist work until I viewed this exhibit. The paintings are immense but filled with great joy and glorious color. Unlike Rothko’s whose work shows the darkness of his life; these paintings reflect exploration of paint application and new medium. A gel medium allowed him to apply paint that retained the impression of the brush strokes. One painting verges on sculpture as the paint is easily two inches thick in some spots. I hunted for postcards of his work in the museum store but had to settle for an exhibition copy, and then I found a book on Remington for $5 and a set of Hiroshi postcards. Thank goodness I had packed my lunch leaving me a few dollars to spend on books. Traffic was heavy on the way home but uneventful. I cracked a few black walnuts in the driveway, modified a frozen pizza and watched a Netflix spoof on Batman. ← Whatever was I thinking? Sylvia, I loved reading about your delightful day in Downtown Houston! I’m a Texas native and I vicariously enjoyed the museum and gallery trip. I’ve lived in Mississippi for 40 years (and love it), but still have fond memories of many trips to Houston to visit relatives, as well as being a regular at Quilt Festival for many years. Thanks for posting this! A day at the museum is always a good day, even when I have to leap over gutters full of water. And Festival is not to be missed–even in the middle of hurricane repairs. I’m sorry I couldn’t go with you. It sounds very interesting.